As a Minnesota company, Hirshfield’s is proud to offer many Minnesota-made products! Hirshfield’s offers a range of products made right here in Minnesota, in addition to manufacturing our very own Hirshfield’s paint! Gov. Mark Dayton has declared this week to be “Minnesota Manufacturers Week,” an annual event designed to educate the public about the role manufacturing plays in the state’s economy. 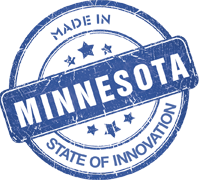 Hirshfield’s is proud to be a part of the week, and to be made in Minnesota! Hirshfield’s is a Minnesota-based, fourth-generation, family owned company. The company has been selling paint since the late 1800′s, and has been making paint right here in Minneapolis since 1982. Hirshfield’s Paint Manufacturing is now the largest manufacturer of trade sales paint in Minnesota. The facility also produces paints, stains and specialty finishes and coatings. Commissioner of the Minnesota Department of Employment and Economic Development helped kick off the week with a new manufacturing database that aims to revitalize business within the state. The database includes Hirshfield’s and 600 other manufacturers, aimed at building connections among the local supply chain. When you shop local, you’re supporting local businesses and the people behind them! Hirshfield’s is proud to be a local Minnesota-based company!